It's the Tuesday after Easter. The songs have been sung, the sacred story told, the good china washed and put away, and we slip back into the daily routine. On this quiet afternoon, I sit and look down the long stretch of years to the Easters of my childhood. In those days I shared a bedroom with my sister in the little yellow house on the corner. The night before Easter, I lay awake in the twin bed with the pink chenille bedspread, my heart filled with anticipation, and thought about the shiny patent leather shoes I'd placed neatly by the side of my bed. 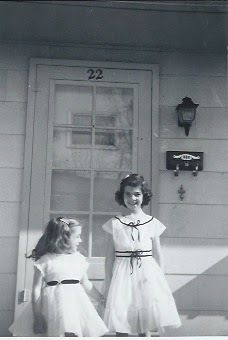 The matching light blue taffeta dresses, the ones my mother had sewn for us, hung in the closet. In the morning there would be colored eggs to find and Easter baskets filled to the brim with goodies. Mom would take out the Italian Easter cookies she had baked and stored in tins along with the Easter bread with the colored egg decorating the middle. Just before we left for church, Dad would go to the refrigerator and take out the orchid corsage. We would watch as he pinned it to her new spring coat, and they exchanged a kiss and a smile. Please visit me at Laced With Grace for the rest of this devotional. Thank you so much.